After intense training and gym sessions your muscles need to repair and grow. Therefore they need protein- which is made from amino acids, the building blocks for muscles. 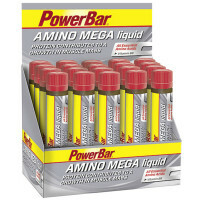 PowerBar AMINO MEGA liquid contains premium whey protein hydrolysate and free amino acids. The convenient ampoule fits in all pockets, so that you can supply your muscles with the important amino acids instantly aftertraining. 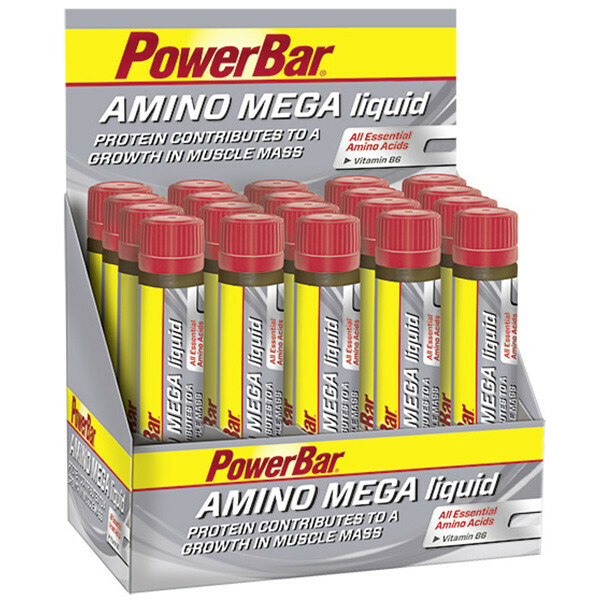 Protein contributes to a growth in muscle mass and maintenance of muscle mass. Orange juice (from juice concentrate), whey protein hydrolysate (from milk) (17 %), water, fructose, acidity regulators (hydrochloric acid, citric acid), L-leucine, L-valine, L-isoleucine, sweeteners (acesulfame K, cyclamates, saccharins), preservatives (potassium sorbate, sodium benzoate), flavouring, vitamin B6. Drink two ampoules per day. Shake ampoule well before use.